Update: CNN reports that a military judge found Pfc. 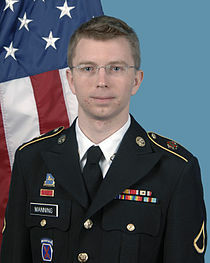 Bradley Manning not guilty of aiding the enemy, but guilty of most of the other charges. U.S. soldier Bradley Manning, who is accused of the biggest leak of classified information in U.S. history, could be sentenced to life in prison today, Reuters reports. A judge is expect to render a verdict in the case against Army Private First Class Manning, 25, who’s charged with aiding the enemy by releasing 700,000 classified documents to WikiLeaks. Judge Colonel Denise Lind ruled that Manning was appropriately trained to understand that releasing the sensitive information put the U.S. at risk. Others say the case is overblown. Posted: 7/30/13 at 10:58 AM under News Story.